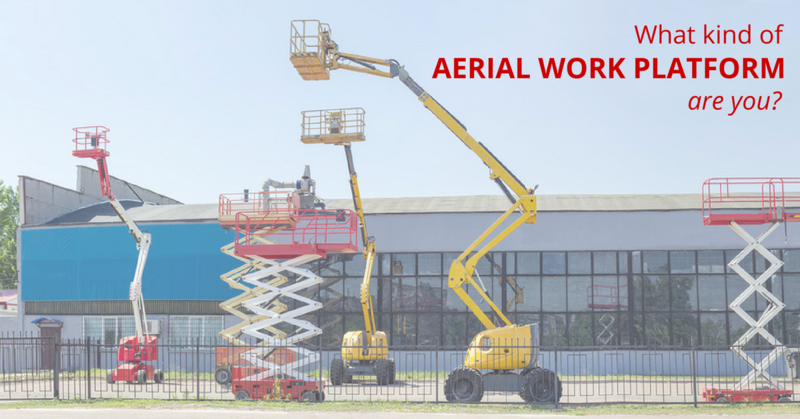 What Type of Aerial Work Platform Are You? How well do you think you know aerial work platforms? Test your knowledge and learn which AWP you are with the latest quiz from popular online provider of aerial lift certifications, CertifyMeOnline.net. The interactive quiz involves 10 true or false questions that describe the various capabilities and design elements of the most popular aerial work platforms. Simply click your answer and move onto the next question to find out your results. Spare a few minutes to test your facts and learn more about boom lifts, telescopic boom lifts, scissor lifts, articulated boom lifts, and aerial lifts. Chances are, you see these machines every day, but you might be surprised at how unique they are and how versatile they can be. You don’t have to be a construction worker to appreciate the power of aerial work platforms and learn some valuable information about AWPs. If you’ve been learning about aerial work platforms lately or are interested in a career as a large equipment operator, you’ll enjoy taking the quiz and learning which aerial work platform you are. Could you be a far-reaching telescopic boom lift, or a more grounded scissor lift? Love heights? Not so much? There’s pretty much an AWP for everyone, including work positions that fit just about any interest and skill-set. Impress your friends and colleagues and learn more about aerial work platforms in our easy and quick online quiz. If you think operating an AWP is the right career for you, whether trimming a tree, working under an airplane, or repairing the power lines in a city, check out the information we have on the certifymeonline.net website and learn how you can complete your career-qualifying aerial work platform certification training. This entry was posted in Aerial Lift Training on September 29, 2017 by admin.